Offer Terms: New Customer Offer Only. Deposit and play £/€10 on Bingo games within 30 days of joining Paddy Power Bingo. Get £/€25 paid as Side Games Bonus (x20 wagering requirement), £/€15 as Bingo Bonus (x5 wagering requirement) & 20 Free Spins (£/€0.20/spin) on Paddy’s Lucky Pigeon mobile game. 1 per customer. Full T&Cs apply. Paddy Power is a well known brand throughout the online gaming world, with thanks to the strong presence of its established sports and casino sites. They are one of the largest bookmakers in Ireland, and because of its well renowned status in the industry, the sites have gained a very trusted reputation over the years. 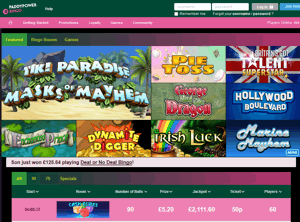 The Paddy Power Bingo site launched in 2006, and has recently updated to the latest offerings on the popular Playtech software. The layout and design is super slick and stylish, and the site in general has an overall classy and modern feel throughout. The gaming on offer is of an exceptional standard, and you’ll find a massive variety of bingo in 36, 40, 75, 80 and 90-ball formats. Rooms include branded favourites aswell as unique Paddy Power specials, and the whole site has an amazing sense of community and fun. There is a great focus on customer service and loyalty, and even though it’s part of such a big brand, it still offers a personal and friendly vibe. The additional gaming is amazing quality too, and you will find easy access to all other Paddy Power platforms via the bingo website should you want to venture into some sports, poker or lotteries. You will find over a hundred popular slots titles including massive progressive slots with jackpots currently reaching over a million quid, and the promotions and loyalty schemes are not to be missed. The new player bonus at Paddy Power is absolutely brilliant. Click on the link at the top of the page for more details. Terms and conditions apply, and all players must be aged 18 or over. There are plenty of other weekly and seasonal promotions which are ever changing available at Paddy Power Bingo too. The Coffee Morning promo runs every Monday to Friday between 9am and 10am GMT, and is a fun numbers game with bonuses and loyalty points up for grabs. The Last Chance Saloon offers all players free scratch cards on certain games if you don’t win, and Paddy’s Lunchbox has a £10K jackpot. 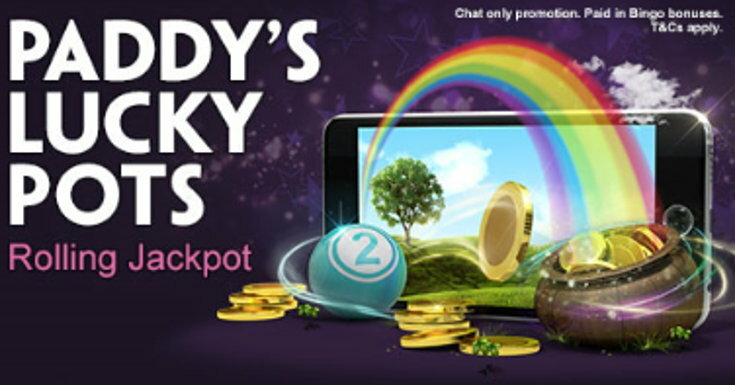 Paddy’s Lucky Pot’s is a rolling jackpot that increases by £5 every day that it’s not claimed. Prize funds will be won if you call a full house on ball 50. Prizes will rise right up to £100, and games take place twice a day. Paddy Power Service Limited are licensed and regulated by the Alderney Gambling Control Commission, and also the Gambling Commission of Great Britain. The site runs on the Playtech gaming software. It’s pretty much a given that most websites will provide 90-ball and 75-ball options to their players, considering that these are the most popular forms of the game. However, Paddy Power Bingo also offers up version of 36, 40 and 80-ball bingo too across a large mixture of branded rooms like Deal or No Deal, Cash Cubes, Bouncy Balls, and Lucky Numbers, as well as specific Paddy Power rooms too. This is a huge selection compared to other sites, and really gives you plenty of variation and choice. Like a fair few other bingo platforms, Paddy Power offers up a selection of side games that can be played should you ever find yourself seeking something a little different. Of these, the main options you’ll find are slot machines. As the website runs on the Playtech network the slots are also Playtech as well. Games include Clover Rollover, Fluffy Favourites, Rainbow Riches and Fruity Burst, and you can can also find a nice variety of scratch cards too. Please read all terms and wagering requirements upon registration, as details are always subject to change. Bingo bonus wager is 3x bingo bonus. With such an established selection of other gaming platforms, you know you’ll be in safe hands at Paddy Power. The site has exceptional graphics, gaming and customer care, and the payouts are huge compared to other sites. If you like a site with plenty of variety, then Paddy Power Bingo is a great place to play.